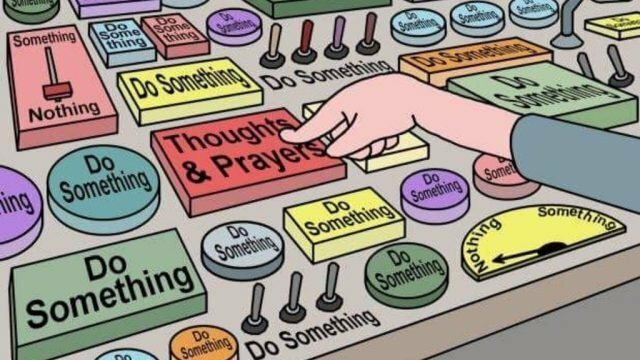 Washington DC – The US Food and Drug Administration today approved the use of Thoughts and Prayers (T&P), for the treatment of gunshot wounds in humans. This announcement follows six years of testing of thoughts and prayers on field mice. Studies showed that mice that had been shot with a single 60-round volley from an AR-15 had 15% greater viability after receiving just three doses of T&P than a control sample of similarly shot mice, once the bloody pulp of a carcass was found. Mice treated with only thoughts or only prayers showed no beneficial response. “Now that T&P is in our medical quiver, we need no other medical response to celebratory gunfire at schools, businesses and sporting events,” said FDA Commissioner Smithin Weston. “On the other hand, when a Republican Senator is shot, then it’s ‘Katie, open the medicine chest’,” said Gottlieb as he sketched an air LOL in front of him. There currently is no FDA guidance for the prevention of gunshot wounds. All research into how to eliminate, minimise or treat gunshot wounds has been prohibited by Wayne LaPierre, spokesnipe for the NRA and denture wearer. “While death from automatic weapons is both preventable and treatable, blah blah blah, NRA,” added the Surgeon General as he blew spit bubbles on his lips. The FDA, an agency within the US Department of Health and Human Services, protects the public health by assuring the safety, effectiveness and security of human and veterinary drugs, vaccines and other biological products for human use, and medical devices. The agency also is responsible for the safety and security of our nation’s food supply, cosmetics, dietary supplements, products that give off electronic radiation and for regulating tobacco products. But not guns because they don’t kill people. It’s the product with a perfect alibi, time after time after time after time after time after time.